It's been raining since late Friday night. I'm tired of rain! Sunday was a lazy, rainy day. I worked in some time to knock out a few more challenges for the Personal Scrapper online National Scrapbook Day crop. Everything I made used the same kit - Personal Scrapper's July '09. There was a challenge to use up a PS kit. I was already down to scraps, but was really able to stretch that kit out! 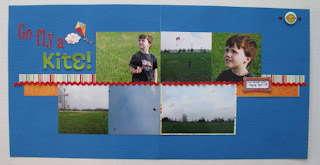 The kite on a journaling card inspired me to dig out these photos of Kevin from a Cub Scout event in '08. I kept it really simple for the "something old, something new" challenge. The old is the kit, but the new is the one "super" flair in the upper left hand corner. I just purchased it on Sunday. I had these photos from Father's Day '06 on my desk. I saw a LO by Kim Moreno in the June Scrapbooks, Etc. magazine that I LOVED, so I lifted it. I thought it would work for the "finish up a PS kit challenge." But...it didn't. Then I realized the blue pattern I used for the photo corners had a purple dot in them. With purple, I had all the colors of the rainbow represented for the "Rainbow Brite" challenge. So no one would think I was making up the purple dot (it's hard to see), I also added some purple brads for accents. I'm really happy with how this one turned out. These photos have been pulled and refiled countless times in the almost four years I've had them! I thought the blue floral pattern left over in the kit would make a nice Mother's Day card. I made three cards, actually. One for each of our mother's and then one for my Grandmother. I do not consider myself to be a cardmaker, but with the help of cards shown in the May Scrapbook Trends and June Scrapbooks, Etc. I found the inspiration I needed to create cards I liked. But I STILL had stuff leftover in that July '09 kit! So, I made cards until I ran out of supplies in the kit. I made four of them. Again, I used cards in the magazines for inspiration. Hi Amy! Love the lo's and cards. It was nice checking in and seeing how you're doing. Hi! I was doing a little blog-hopping, and found your blog through Deana's, and I just wanted to say that your cards are lovely! Great job using up a kit--you really stretched it! I love your cards, Amy! I love your cards Amy!! So cute!